NO PURCHASE NECESSARY. All entries shall become the property of www.smoothjazznews.com and Smooth Jazz News, a California corporation, and may be used for future email correspondence only from Smooth Jazz News. However, Smooth Jazz News does not share or sell any of entrants’ information to any other organization. 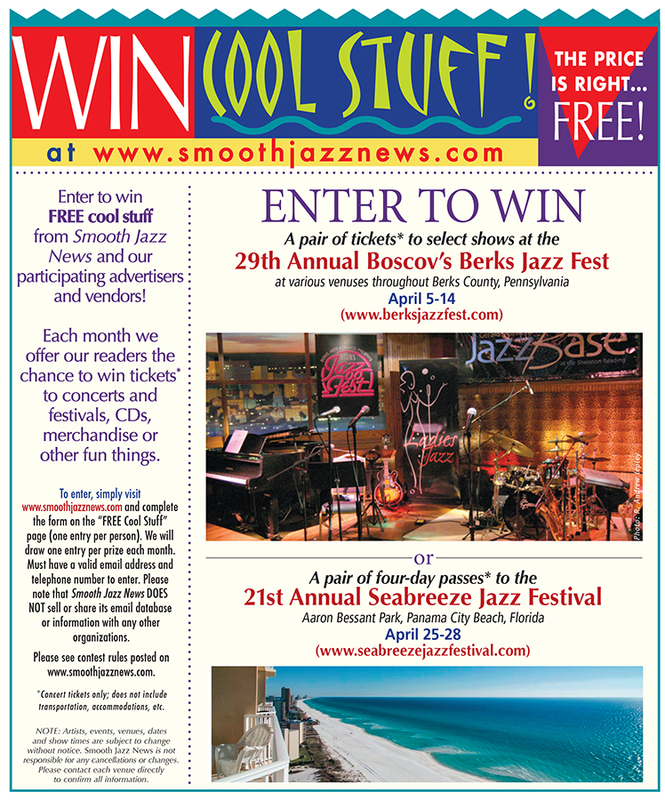 Smooth Jazz News is not responsible for lost, misdirected, delayed or incomplete entries. In accepting the prize, the winner and guest acknowledges that Smooth Jazz News and any respective affiliates, employees agents and/or representatives may not be held liable for any loss, damages or injury associated with accepting or using this prize. The prize specified is exactly what the winner will receive, and does not include any transportation to and from the event, parking, meals, accommodations, etc. Winner will be determined by random drawing and will be notified by e-mail and/or telephone. Prize is not transferable and is not redeemable for cash. Odds of winning are determined by number of entries. Winner’s name may be used on website, www.smoothjazznews.com. By entering, winner consents to use of name and likeness for promotional purpose without additional compensation. Void where prohibited or restricted by law.